Home/Investigators and Research Centers/Investigators/Thomas Molinaro, M.D. Dr. Thomas A. Molinaro, MD, MSCE is an attending physician at Reproductive Medicine Associates of New Jersey where he serves as lead physician of Eatontown office and Clinical Assistant Professor at Robert Wood Johnson Medical School. 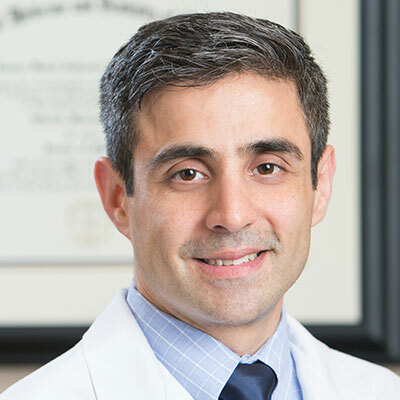 Dr. Molinaro graduated from Loyola College in Maryland and then pursued a Masters in Physiology from Georgetown University. He went on to graduate medical school at New Jersey Medical School and completed his residency in Obstetrics and Gynecology as well as a fellowship in Reproductive Endocrinology and Infertility at the University of Pennsylvania. During fellowship, Dr. Molinaro completed a Masters of Science in Clinical Epidemiology through an NIH sponsored grant. While at the University of Pennsylvania he was awarded the Mikuta Award for Professionalism in Medicine as well as the Touchstone Award for excellence in research. Upon graduating from Fellowship, he joined Reproductive Medicine Associates of New Jersey as an attending physician. Following declining human chorionic gonadotropin values in pregnancies of unknown location: when is it safe to stop? A decrease in serum estradiol levels after human chorionic gonadotrophin administration predicts significantly lower clinical pregnancy and live birth rates in in vitro fertilization cycles. Ovarian stimulation and low birth weight in newborns conceived through in vitro fertilization. Does a prediction model for pregnancy of unknown location developed in the UK validate on a US population? A Strict Infertility Diagnosis Has Poor Agreement with the Clinical Diagnosis Entered Into SART. Fertil Steril, 92(6): 2088-90, 2009. Prediction of location of a nonviable pregnancy when ultrasound is nondiagnostic. OP35.04: Ultrasound Obstet Gynecol, 34(S1):175, 2009. The Menstrual Cycle. The National Medical Series for Independent Study. 6th ed. S. Pfeifer (eds.). Williams & Wilkins, Chapter 19: 205-214, 2008. Amenorrhea. The National Medical Series for Independent Study. 6th ed. S. Pfeifer (eds.). Williams & Wilkins, Chapter 20: 215-226, 2008. 6th ed. S. Pfeifer (eds.). Williams & Wilkins, Chapter 22: 215-226, 2008. Ectopic Pregnancies in Unusual Locations. Semin Reprod Med, 25(2):123-30, 2007. Abdominal pregnancy, cesarean scar pregnancy, and heterotopic pregnancy. UpToDate, Rose, BD (Ed), UpToDate, Waltham, MA, 2007. Genomic instability in gadd45-deficient mice.